How Should Progressives Respond to Trump’s Trade Tantrums? The country needs a real industrial policy that helps everyone. Progressives like Ohio Senator Sherrod Brown and Elizabeth Warren showed more sense—they cautiously praised Trump for challenging China’s mercantilist policies. So did Conor Lamb, the surprise victor in the House special election in Pennsylvania. They understood that just because Trump denounces our “lousy trade deals” doesn’t mean they have to defend them. The Trump-induced hysteria about protectionism and trade wars largely ignores the reality that our globalization strategy, defined by and for global corporations and banks, has savaged working people—and the wealthy have cleaned up. Best estimates suggest the “China shock” alone—the result of running the largest deficits with one country in the history of the world—cost 2.4 million US jobs between 1999 and 2011. Companies used the threat of moving abroad to bludgeon workers into accepting cuts in wages and benefits. Our callous globalization strategy contributed directly to the rising incidence of divorce and suicides, the spreading opioid epidemic, declining life expectancy, extreme inequality, and Trump’s election victory. In fact, trade agreements increasingly have little to do with actual free trade. Tariffs were relatively low before the North American Free Trade Agreement and its successors. Trade agreements generally consist of thousands of pages formalizing deals forged between powerful interests. Multinational banks and drug companies made out like bandits. Corporations gained their own closed legal tribunals. 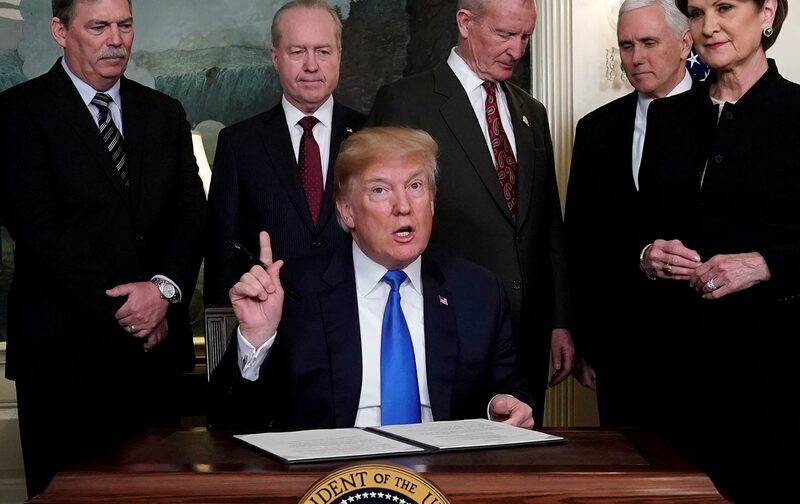 Trade accords increasingly focus not on tariffs but internal rules—on investment guarantees, subsidies, health and safety, and intellectual property rights. The classic economic case for free trade holds that, while there would be winners and losers, the benefits were so great that the winners can compensate the losers. But the deals are about political power, not economic theory. Corporate globalization has empowered the few, and it has largely scorned the losers. Trump’s decision to take on China is long overdue. His withdrawal from the Trans-Pacific Partnership and his insistence on renegotiating NAFTA and the Korean Trade Accord, however noxiously expressed, are justified. Not surprisingly, however, Trump and his team have thus far provided more theater than substance, and are executing this trade war with an extremely haphazard approach—overall, they are simply clueless about the core elements of a sensible globalization strategy. So what would a progressive strategy include? Renegotiation of current treaties would write in enforceable protections for environmental and labor standards, while eliminating the private tribunal system for investors. Strengthened and clarified content and rules-of-origin requirements for automobiles and other manufactured goods would help foster more but more balanced trade. The extended monopoly protections for drug companies should be eliminated. Enforceable provisions that penalize currency manipulation are essential. Trade accords should not undermine domestic health and safety laws. The Congressional Progressive Caucus principles for the NAFTA renegotiations offer a sensible guide. Trump’s quick deal with South Korea gave modest relief to steel and truck markets, but failed to address any of the structural issues. A real progressive strategy goes far beyond simply renegotiating the trade deals. As Harvard’s Dani Rodrik has detailed, trade accords are less about tariffs than about protecting powerful interests—particularly big banks, multinational corporations, and the drug companies. A revised trade policy would challenge those interests—beginning with a focus on breaking up the big banks, going after high-tech and digital monopolies, and limiting the privileges accorded the drug companies. It would also feature a global effort to close tax havens and crack down on tax avoidance. A progressive globalization strategy would also break with neoliberal market fundamentalism at home. Led by Bill Clinton’s New Democrats, the Wall Street wing of the Democratic Party championed deregulation, balanced budgets, and rolling back social insurance. Republicans—including Trump—push deregulation, privatization, and top-end tax cuts that benefit the winners, while seeking to rollback social insurance that provides some security for all. A progressive policy would extend rather than roll back social insurance. A modern day Economic Bill of Rights—a job guarantee, the right to health care, public education through college, a living wage and a secure retirement—becomes more essential in the velocity of global competition. The workers’ voice must be strengthened through labor law reforms, the end to right to work, and codetermination arrangements that involve workers in corporate strategy. The United States also needs to pursue the public investment and planning vital to competing in a global economy. Obama’s chief economic adviser, Larry Summers, literally banned use of the term “industrial policy” inside the White House. In fact, the United States sustains stealth industrial policies—the military-industrial complex is a prime example—that propel its leading export industries. Trump touts “Buy America, Hire America” policies in stump speeches, if not in practice, but his administration slights vital public investment. His administration shelved its much-advertised infrastructure plan in record time. Investments in science and technology are being slashed. Coherent policies to boost the cutting-edge industries of the future—renewable energy and energy efficiency, robotics, biotechnology—are nowhere to be seen. The contrast with mercantilist China is stark. “Made in China 2025” isn’t simply a Buy China rhetorical device. China has identified key advanced manufacturing industries—such as robotics and semiconductors—that it plans to dominate by 2025. It will employ the full range of its mercantilist policies to do so: acquiring foreign companies, forcing foreign companies into Chinese partnership, stealing technology, subsidizing publicly owned companies, targeting foreign markets, coordinating public and private investment and more. Trump targeted “Made in China 2025” in announcing his tariffs, but his challenge to China is more likely to end with a whimper than a bang. Wall Street is already raising alarms about an escalating trade war. American companies, particularly those with supply chains dependent on China—including Apple, Wallmart, and Google—will push hard for business as usual. China’s retaliatory tariffs—targeting products Americans grow in rural areas like soybeans and pork—show they know where Trump country is. The Chinese are likely to offer showy concessions to allow Trump to preen. They’ll invite him to Beijing and roll out the red carpet, complete with a military parade. But, as Zhu Guangyao, vice minister of finance boasted in response to Trump’s tariffs, “China has never succumbed to external pressure.” The Chinese leaders will continue to pursue their ambitious plans to dominate the industries of the future. The question is how the United States will respond. Serious industrial policy isn’t alien to America. Alexander Hamilton’s stunning “Report on Manufactures” helped guide the republic in its first years. Republican Abraham Lincoln built the railroads and founded the land grant colleges, as part of the “the internal improvements” he argued were vital to the emerging industrial nation. In 1944, as the end of World War II was in sight, Roosevelt promised an Economic Bill of Rights for all. Eisenhower built the interstate highways and sustained the policies that subsidized the growth of the suburbs. Trump’s pugnacious indictment of the lies and hypocrisies of our global trade strategies is long overdue. His tariffs open the debate. His negotiators will seek to cut a marginally better deal, as they did in the Korean negotiations. But his administration stands in the way of the fundamental reforms needed to make this economy work for working people. Progressives need to use this moment to show Americans there are alternatives.